55, Beech Street, Elland, West Yorkshire. In the late 50's early 60's Elland was a typical West Riding thriving industrial town, it was famous for its textile mills, engineering and brick works. The mills being the largest employers hence the rows and rows of Victorian back to back houses. For youngsters it was considered a last resort if you worked in the mills and a success if you had an apprenticeship bearing in mind both my parents worked in the mills most of their lives. In fact my parents met in the mill pictured on the left. When one viewed Elland from the hill tops you could see the smog as smoke poured from the mill chimneys, the town looked dirty and lacking the blue skies of Greetland. Today I would say Elland was not an ideal place to live but when I was 14 years old it did not matter to me as one just fits in with what your parents think best. So Beech Street was one of those back to back terrace houses where people had to get on with little privicy or personal space. Pictures on the left show Beech Street as it is today we lived halfway down the Street on the righthand side, the house pictured is not our house but is the same. Still no bathroom and the kitchen was in the cellar and we had two bedrooms. Christopher and I had bunkbeds as we had to keep a bed open for Arthur and David when they were on leave from the RAF. Elland was a good place for teenages without transport as it was a small town rather than a village and had lots for us to do. We had a youth club in Coronation Street, Elland 5th Boys Brigade, the swimming baths, a cinema and within walking distance of the Rochdale canal and River Calder where I started my fishing hobby. It was via the youth club that I met Chris Letza and became interested in music and playing guitar. The forming of Peter and the Wolves gave me the drive to learn music and it kept me off the streets and out of potential trouble. Most of the boys in the group were from a wealthier background as Peter and Tony's parents had their own businesses and they went to private school. Not that this was important to me but it introduced me to a different mix of friends. At the same time Jewsons, my place of work, gave me an incentive to do better. Being not so well off was not a disadvantage as my parents never failed in bringing us up, we were never hungry, always clean and well dressed. In 1965 my father decided he wanted a change of job, something he did on a regular basis, at 18 years old I was not ready to move from Elland due to the fact I had a good job and was playing in the band. However, Mum, Dad and Christopher head off to Burton on Trent where he had a tied house gardening job, mother would be a cleaner and Christopher managed to get a farming job. As for me, I was so lucky to have my sister Christine and husband Barry living close by and they kindly offered to take me in despite the fact the Christine had just given birth to David their second child. When I was 18 it was different than it is for 18 year olds today, we were less street wise, there was no such thing as back packing, the furthest I had travelled was the journey from Coventry. Only the rich went to univercity and we did not have cars for transport. Loosing Chris and my parents was a hardship so I just had to hold my head up and get on with life and learn to mature on my own steam. So I am off again to Lynhurst, Dewsbury Road Elland. Lyndhurst was a much nicer house than I had lived in before apart from Grans house in Birchencliffe, the bonus was I had my own bedroom for the first time in my life. Chris and Barry were great, I think I was a good lodger and tried my best not to intrude as much as possible. I even changed nappies for the first time, babysat and helped with washing up after meals. We had lots of fun doing basic things and had similar tastes in music, we would enjoy some TV watching Val Doonican and when Jaque Lucia had a programme with his jaz trio we would pretend that we were playing, Barry on the drums, Chris on piano and me on double bass, yes we would mime to them until we would burst into uncontrolable laughter. Whilst at Lyndhurst I changed jobs moving from Jewson to Tinkers Photographers the picture on the left is one I took with my first camera. I was also at the age where I had lots of girl friends but nothing what you might call serious or steady until I met my current wife Pauline. Barry was an engineer in the tooling business he had a good job, however, they were thinking about finding a better life in Australia but at this stage it was only a dream. Skilled people had a chance to go to Australia on a cheap package, think it was about £50, a really good way to start a new life. So I am happy very settled, I have a steady girl friend, good job and all is going well. Would'nt you know my father had decided Burton on Trent is no longer for him and planned to return to Yorkshire. 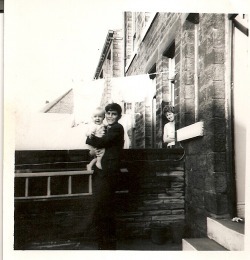 My parents bought their first ever owned house back in Greetland, 56, Hoults Lane. So for me its back to Greetland.